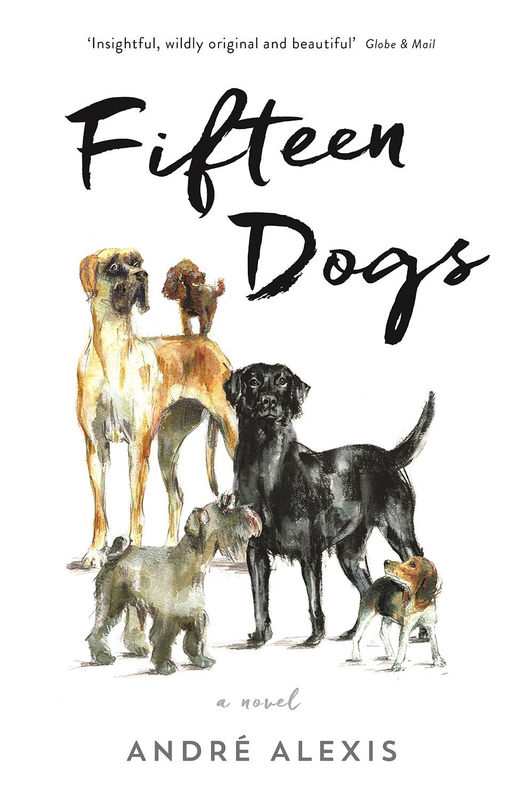 André Alexis’s Fifteen Dogs has been longlisted for this year’s Giller Prize. It’s by far the oddest, and possibly most absurd, book I’ve read in a long while. Indeed, to say I didn’t much like it might be an understatement. Under normal circumstances, I’m sure I would have abandoned this strange and unusual novella. But as some of you will no doubt know, every year since 2011 I have taken part in the Shadow Giller — chaired by KevinfromCanada — in which a group of us read and review all the books on the Giller Prize longlist for that year. Between the four of us, we then choose a winner in advance of the real Giller. (You can read more about how the Shadow Giller came about on Kevin’s blog here.) And because I’m taking part in the process once again for 2015, I felt that I had to finish the book — even when every bone (pun not intended) in my body told me to put it aside and read something else instead! So, what’s so weird about it, I hear you ask? Well, it takes the form of a fable in which the Greek gods Hermes and Apollo give a group of dogs the gift of consciousness. The idea is that intelligence does not make humans any more superior or happier than other animals. “— I’ll wager a year’s servitude, said Apollo, that animals — any animal you choose — would be even more unhappy than humans are, if they had human intelligence. And then 15 dogs, all staying overnight in a veterinary clinic in Toronto, discover that they can suddenly think for themselves, talk in a new language (English) and reason with one another. Yes, I told you it was a weird book. Kim’s convinced me — I won’t be reading this one unless it make the shortlist (and even then only to try to figure out what the judges could be thinking). She is moving on to Patrick deWitt’s Undermajordomo Minor next. I’m almost finished Connie Gault’s A Beauty and should have a review up later this week. It turns out I was a tad optimistic in announcing the return of the Kevin From Canada blog. A medical procedure that I thought I could take in stride has got in the way of both reading and blogging. I’m hoping to be back in shape shortly. I have all the Giller titles on hand and still intend to get to as many as possible. Thanks in advance for bearing with me. Certainly some familiar names and a few surprise absences (Jane Urquhart and Nino Ricci to name just two). As I indicated in my last post, I haven’t read a single one of these — so it is time to get down to some serious book buying and reading. Health issues have meant the Kevin from Canada blog has been silent for all of 2015. Things have progressed however and I’m ready to resume reading (and blogging) — although I’ll warn in advance that there may still be some down periods. My personal thanks to those who have sent comments and emails expressing concerns and support for my challenge. The decision to start the blog up again now was undoubtedly influenced by the fact that the 2015 Giller Prize longlist will be announced Sept. 9. Regular visitors here are aware that since year two of the Giller I have chaired a “Shadow Jury” that has dueled with the Real Jury in making choices. It has taken a variety of forms — you can find the story of its history here. This year’s jury will remain the same as in recent years. Kim Forrester, an Aussie ex-pat who lives in London, blogs at Reading Matters. Trevor Berrett blogs at The Mookse and the Gripes from his home base in Utah. And Alison Gzowski is an editor at the Globe and Mail. As in past years, I’ll post excerpts of Kim and Trevor’s reviews with links to the full version. Alison may be contributing a few guest posts here. With only four weeks to the shortlist announcement, we do our best to try to make sure at least one of us reads each longlist book — we don’t really get going until the shortlist season. It is great to be back. I certainly welcome comments on the Giller (and links to your own reviews if they are up). We have had a lot of fun with it over the last five years here and I hope this year will be equally as rewarding and entertaining.